Surf sprays two storeys high as roaring waves crash ashore at the Little Venice area of Mykonos Town, flooding the entire seaside strip of cocktail bar terraces. This photo was posted on the Mykonos LIVE TV Facebook page on January 18, the day gale-force winds raged across much of Greece. 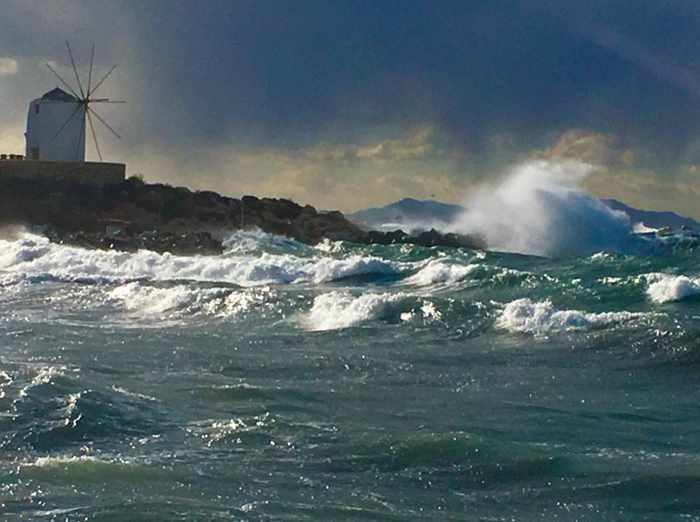 Storm scenes: When wild winter weather swept across Europe this week, Greece wound up in the path of powerful winds that pounded some places, including Syros island, with gusts reaching as high as 122 kmh — the equivalent to force 12 on the Beaufort wind scale. 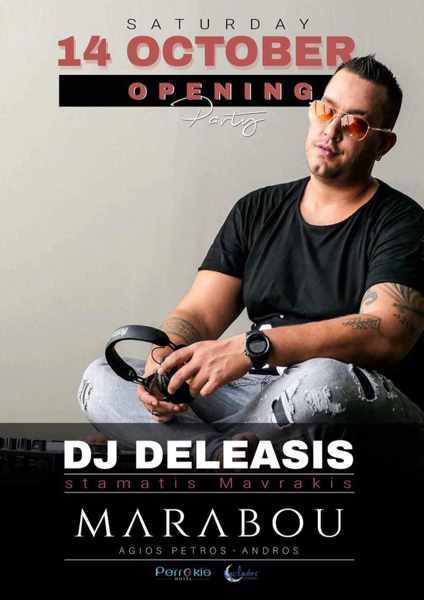 The fierce winds raged relentlessly on Thursday January 18, toppling trees on several islands, damaging one of the iconic windmills on Mykonos, and preventing planes from landing at Syros airport. 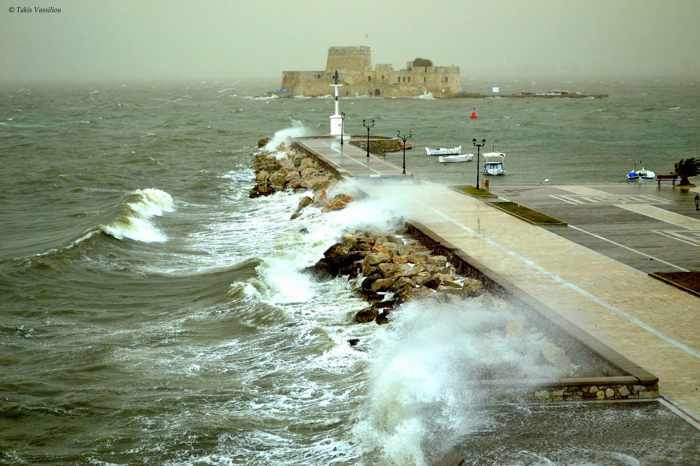 The storm disrupted ferry travel and shipping, too, as rough seas forced the cancellation of many sailings as well as the closure of the ports at Lavrio and Rafina. 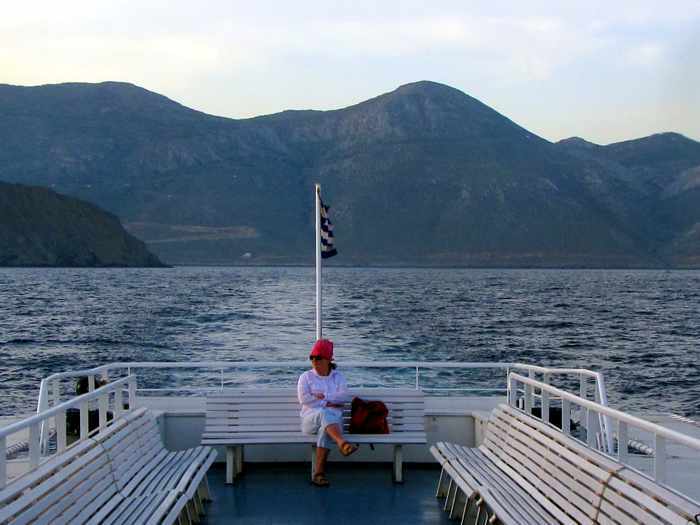 At Piraeus port, the passenger ferry Panagia Agiasou broke away from its moorings during the tempest, while waterfront areas at Mykonos Town, and Kini Beach on Syros, sustained damage from massive waves that walloped the shore. Although most residents stayed indoors to avoid the incessant blasts of wind, which made walking perilous and even driving difficult, some did venture out to observe nature’s fury and photograph the stormy conditions. 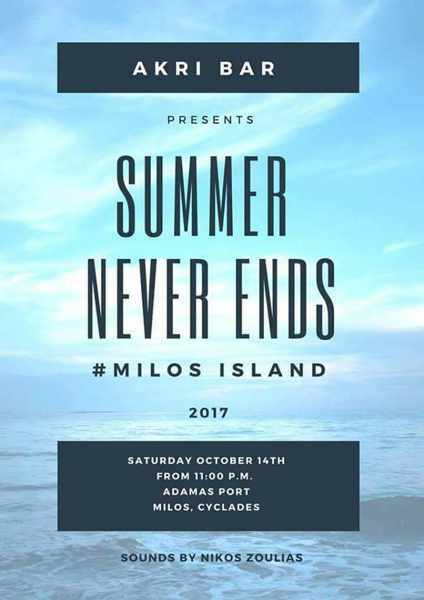 I found numerous pictures and videos on social media showing skies filled with massive dark clouds, and huge waves crashing onto seafronts and beaches in Mykonos, Paros, Naxos, Syros, Rhodes, Lesvos, Samos, Skyros, Skopelos, Ithaca, Paxos, Kefalonia, Nafplio, Athens and elsewhere. 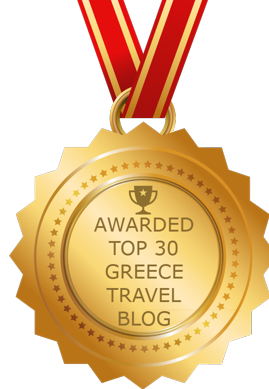 Many of the images showed that, even in ferocious weather, the scenic beauty of Greece’s coastal areas still stands out. Maria Alipranti captured sunlight illuminating stormclouds and waves at the Parikia waterfront on Paros. 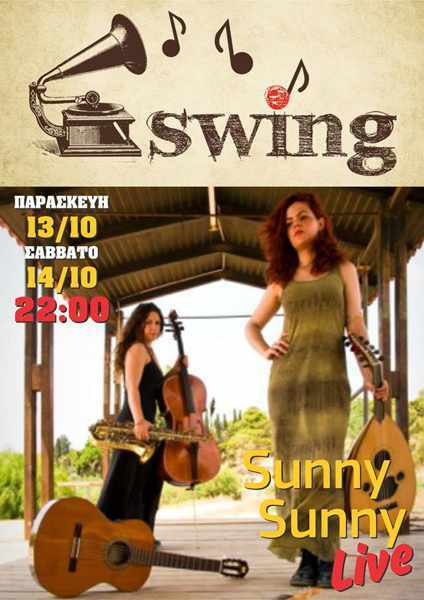 Her photo, and more than 20 others she shot, were shared on the ΠΑΡΟΣ like page on Facebook. Please click on the link below to turn to page 2, where I have posted more photos and several videos that were shared on social media. Stormwaters surged across fields, farmlands and roads on Naxos after heavy rain lashed the island on Tuesday. 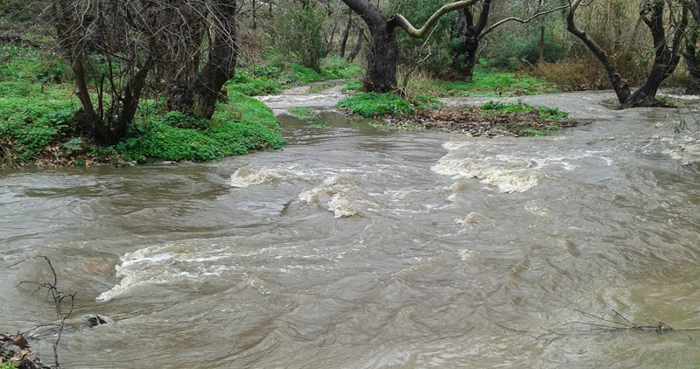 This picture of an overflowing stream appeared in a January 23 2017 photo report published by Naxos Times. 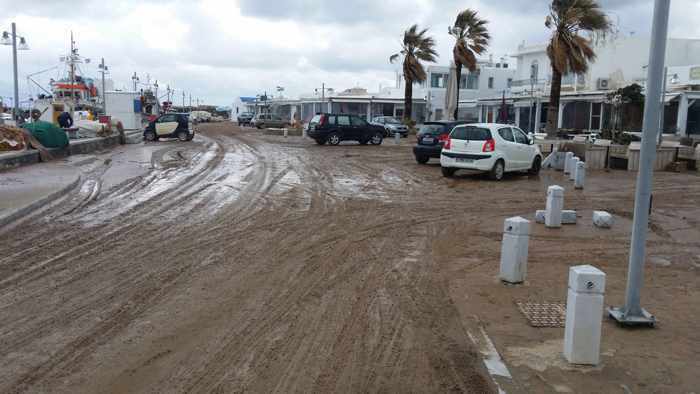 After the Tuesday rains, this waterfront strip in Naoussa village on Paros was left a complete muddy mess. This was one of several photos that Kay Will shared on Facebook to show the aftermath of the storm. Devastating downpours: Winter weather has been packing a powerful punch in Greece this month. First it was unusually cold temperatures and snowfalls that struck much of the country during the first week of January (see the stunning pictures and videos in my recent posts Amazing winter wonderland scenes from Greece and Greece in white winter glory). The mercury has since climbed and the snow in many places has melted, but Mother Nature wasn’t finished — she decided to pound some of the Cyclades islands with heavy downpours that lasted throughout the day on Tuesday January 24. The rain, occasionally accompanied by hail, pelted Paros, Naxos, Tinos, Mykonos, Sifnos, Andros and other islands for more than 24 hours. 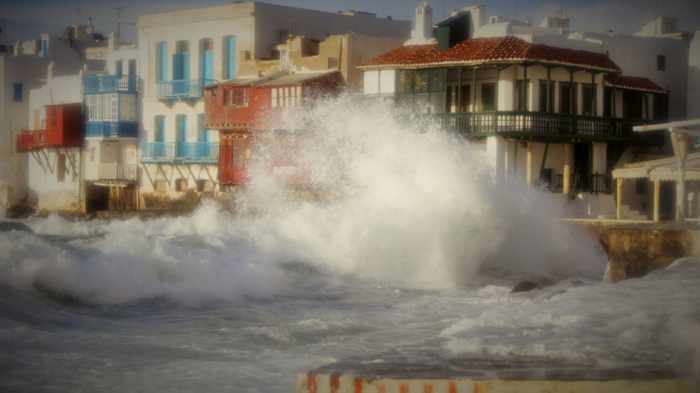 Paros was particularly hard hit by the storm and seems to have suffered the most water damage. There was extensive soil erosion as well as some landslides, and flooding caused widespread damage to farm fields, shops, homes, churches, vehicles, and roadways. According to a January 25 report on the local news website ParosIn, damage to some areas was so severe, the island’s mayor has written to regional authorities requesting they declare a state of emergency so that resources can be deployed to assist with the massive cleanup and repair work that must now be undertaken. 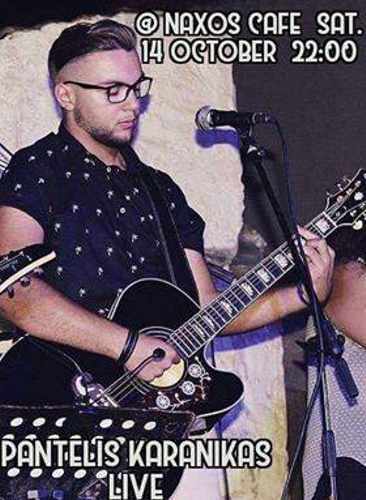 The news story noted that the mayor’s letter described severe damage in the municipal areas of Naoussa, Kostos, Lefkon, Archilocus, and Marpissa, as well as places in and around Parikia. 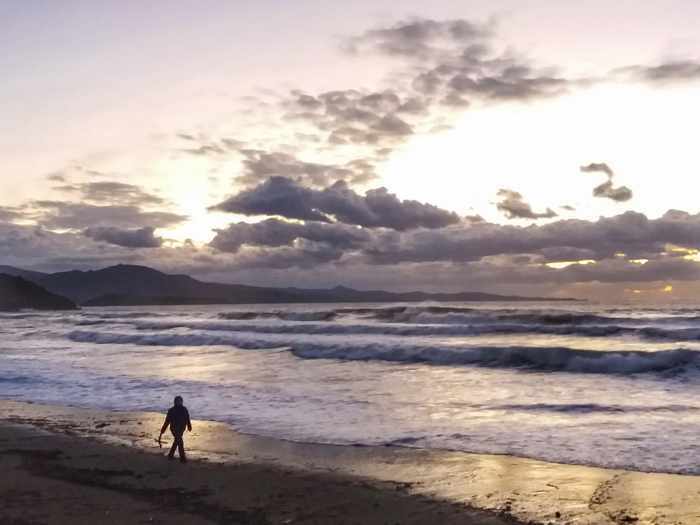 According to the Naxos Times, the deluge doused Naxos with so much rain that streams turned into “rushing rivers” that “drowned” farms and fields, and flooded some roads. 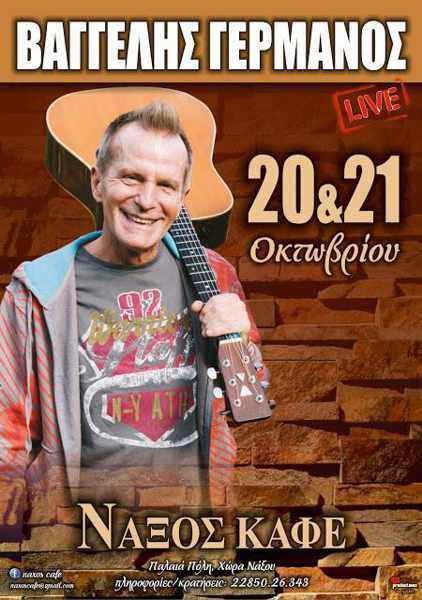 Near Koronida village, where wildfires had burned several weeks before, the water washing down the streams was black from all the soot being carried away, the January 24 Naxos Times report stated. Click on the link below to continue reading and see more storm photos and video on page 2 of this post.